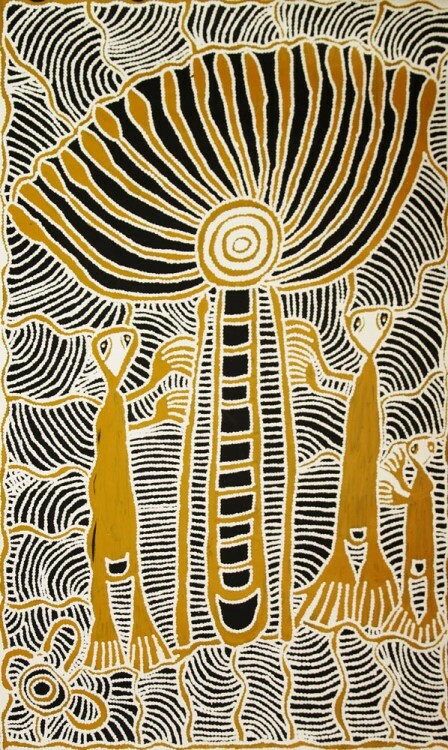 Subjects and Themes(Dreaming): Windmill and Spirit Men, Bush potato and The Seven Sisters. is Luritja. 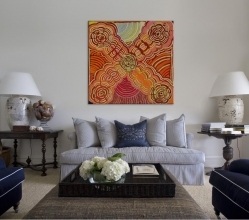 Her mother is the highly acclaimed artist Linda Syddick and often paints alongside Linda and her daughter Samantha Daniels Napaltjarri. She has had sell out exhibitions with Maruku Art Centre at Yulara, Ayers Rock, and Northern Territory. 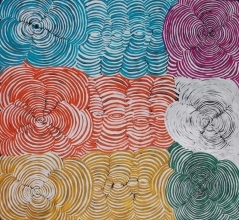 She won the Art Award prize in 2006 from the Maruku Art Centre. 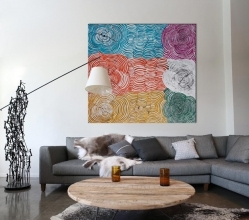 She has also successfully sold her artwork with Alice Springs Art Galleries. In this painting Ruby is painting one of her mother's themes - Windmill - first contact. This story pertains to the first time her people saw a windmill which they believed to be a "monstor" and at which spears were thrown. Her dreamings include Bush potato and The Seven Sisters. Ruby often paints in a narrative style that passes on the dreaming stories of her mother's country. Her unique style blends traditional dot work with more contemporary patterning. 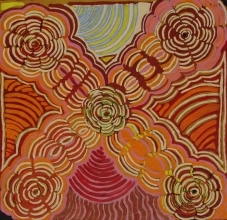 In this painting Ruby is painting one of her mother's themes - Windmill - first contact. This story pertains to the first time her people saw a windmill which they believed to be a "monster" and at which spears were thrown.